Rich and intense on the nose with a sweetness reminding me of molasses. Fruity with red fruits, strawberries and red currant in particular. Notes of dark chocolate arrive, lingering with hints of almonds and tender oak spice in the background. The alcohol is present but relatively well integrated and not pungent. An intense and dry start on the palate. Then sweetness arrives with barley sugar, toffee and raisins, followed by milk chocolate, sherry and warming spices of white pepper and tender oak. Caramelised ginger and tobacco leaves towards the finish. 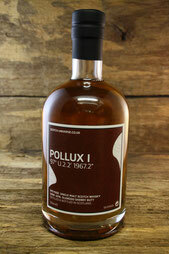 The finish is medium long, warm, slightly peppery and dry with oak and nutmeg. More fruits but less sweetness on the nose with a splash of water. Surprisingly, the alcohol is more present now, supported by prickling oak. Intense, yet vibrant on the palate with prickling oak, cracked black pepper, even chili. Multi-layered and very warming with a tamed fruity sweetness. The finish still shows medium length. Warming and less dry with sweet barley sugar and oak spice. A powerful dram with a pleasant nose and delicate palate. Although almost 60% abv, the alcohol makes it not too sharp and the oloroso cask has already mellowed enough. However, not the heavy sherry flavours but the filigree red fruity notes, toffee, almonds and oak spice dominate here. More complex especially on the palate when diluted.